(Newser) – Some of the world's last remaining woolly mammoths literally died of thirst, according to a new study published in the Proceedings of the National Academy of Sciences. 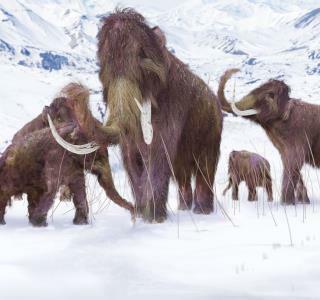 The ancient animals were still living on a small island off the coast of Alaska until about 5,600 years ago—or 5,000 or so years after most woolly mammoths had died off, the Alaska Dispatch News reports. The study concludes it was a lack of fresh water that finally did in the holdouts on St. Paul Island. According to the BBC, rising ocean levels at the end of the Ice Age not only shrank the woolly mammoths' island home, but inundated freshwater reservoirs with seawater. How could we have rising seas and animals dying of thirst back then when man wasn't driving around in cars. Perhaps maybe because climate change is a farce!! While trampling in snow.. STUPID!!! I believe this study about as much as the one about the dinosaurs dying while taking a selfie as the asteroid approached.